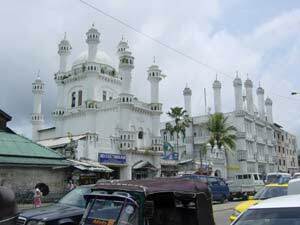 Dewatagaha Mosque in Lipton's Circus, Colombo, has become a byword in every Muslim home, and no Muslim passes the shrine of the saint without paying his respects. The 150-year-old shrine the resting-place of the Muslim saint, His Holiness Seyedina as-Sheikh Usman Siddique Ibn Ahdurrahman, who visited Ceylon from Arafat, Arabia and visited Adam's Peak and Dafter Jailani shrine at Balangoda, and later resided in what was later known as Cinnamon Gardens, has an interesting history behind it. In 1820 a Sinhalese woman oil monger, the sole wage-earner of the family, was going on her daily rounds, traveling from Bambalapitiya through the cinnamon jungle to Maradana. n this jungle she tripped over the root of a cadju tree and fell. Her clay pot was smashed to pieces. "Aiyo, aiyo!" she cried out, "My family will have no food today. My only means of earning has been destroyed." She wept her eyes out in desperation and exhausted, fell fast asleep. A voice awakened her. It asked her not to despair and bade her rise, assuring her that everything would be well soon. She looked up and found no one in sight and in de­speration burst into tears again. Again the voice repeated the reassuring words. This was incredible as she had hardly seen any human being within earshot in that dense jungle. Suddenly she saw an old man in green garb and his holy mien was an inspiring sight to the stricken woman. "You have nothing to fear," he told her. "I shall give you back your oil. Only fetch me a pot." The woman started off towards Maradana to the house of a regular customer, a Muslim by the name of Mamma Lebbe and asked his mother to give her a new pot. When the latter queried this strange request the oil monger said: "I shall come back and tell you my story." She returned with the pot to the jungle to find the old man reclining against a ‘dawata' or ‘devata' tree. He directed her to place the pot where the first one was broken. He pressed his foot on the ground and, behold, oil bubbled up from the ground! The woman was speechless with amazement. Picking some leaves from a cadju tree he asked her to scoop up the oil with them and fill her pot. "You can now earn your living," he told her and also requested her to inform her Muslim customers and show them the spot where he appeared. The grateful oil monger made obeisance to the saint and invoked his blessings. She hurried to the house of Mamma Lebbe and related her story of the miracle to Mamma Lebbe's mother. A party comprising Mamma Lebbe, Periya Pitche, Meera Kani and the oil monger left for the spot to investigate and found evidence of the miracle—the broken pot, the seeping oil, the cadju tree, the cadju leaves the davata tree (gaha), etc. The party of Mushinis recited Yaseen and Fathiha and prayed: "Oh Vohiyullah (saint)! Praise be to Allah for having given us the opportunity to bear witness to your miracle. Almighty Allah, may You reveal to us the identity of this Voliyullah." They returned to Mamma Lebbe's mother and vouched for the truth of the miracle and the accuracy of the woman's report. They bought up the rest of the woman's oil after she had finished her rounds and dismissed her after giving her a good meal. The Muslims of the area appointed Maniina Lebbe as their leader, and Trustee of the shrine. The identity of the saint was still unknown. 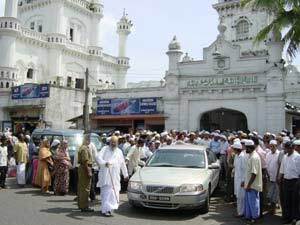 In 1847, twenty-seven years after the miracle, there came from Maghrib to this Island a divine, Sheikh Ali Jahbarooth Moulana, who took up his residence at the Maradana Mosque, Colombo. 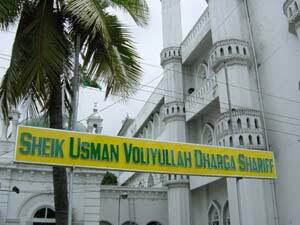 He was informed of the Dawatagaha miracle and on an appointed Friday, after Jumma prayers, a party of Muslims headed by Jabbarooth Moulana and including Katheeb Assena Lebbe, Sheikh Abdul Quadir and others proceeded to the shrine and recited Kaththam Fathiha. 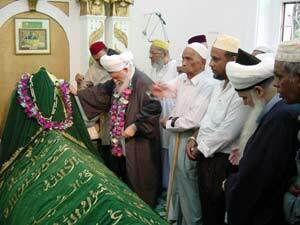 "Oh, Almighty Allah, this is a most venerable saint. His name is Seyed Usman Siddiq Ibn Abdurahman, one who came to this Island on a pilgrimage to Adam's Peak and after living in the vicinity for some time, died here." He then turned to Katheeb Thambi Lebbe and said, "What month is this?" 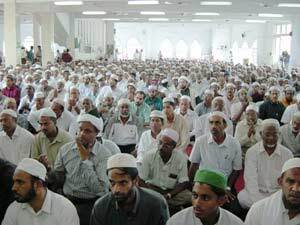 Jabbarooth Moulana then told those assembled, "We shall recite Kaththam Fathiha for the ten days of this month every year in the saint's memory and distribute "niyath." He gave a sovereign to the Trustee, Mamma Lebbe, and asked him to prepare ghee rice for the pilgrims. He also asked the Muslims to find a flagpole. A bamboo stalk was found near Mamma Lebbe's house and handed over to Jabbarooth Moulana who exclaimed "Marhaba! Marhaba!" and tearing a portion of his white turban, made a flag of it, and planted the flagpole at the head of the grave.